Tomorrow morning I am off to Cyprus for a bit of sun and relaxation. I have packed my trainers and other running gear and intend to get up early every morning to go for a mile run. I will blog during the week to let you all know how it goes. Running a mile a day is now so part of my routine that it will be hard for me not too. It will be a chance to see the resort quiet before the majority of people are up. Maybe there will be a few other runners out there too. I will be able to see the resort at its best. My metabolism will be kept high which will be important as I will presumably be eating more of the naughty carb laden stuff that I usually let myself. Once I return from my holiday I won’t feel guilty that I have not run and will be able to continue to easily without any adverse effects. It will be a definite start to my day and will feel good and not lazy when I am lying on a lounger. 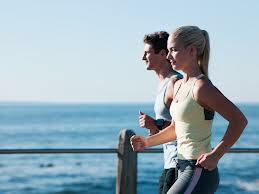 Do you have any tips on how to run and exercise when on holiday? The image in this post is from here. This entry was posted in Running and tagged exercise on holiday, good habits, life, lifestyle, Mile run, running, running a mile, running on holiday, sports. Bookmark the permalink. There is a running group in Paphos that runs most mornings, various distances. I like to run with them whilst I am there. We will be out later in the year. I have the same idea as you, run early in the morning, keep metabolism up so I can enjoy my holiday relatively guilt free. I have a half marathon to run the weekend after I come back so need to keep training. It is very hot in Cyprus at the moment so you need to be out early morning (by 6am) because it is too hot otherwise. Expect it to be hard for the first couple of days whilst your body gets used to the heat, although we have had a good ease in with the weather we have had here for the last few days. Make sure you take water and top up with electrolytes. Most of all enjoy the fresh air, beautiful weather and scenery of Cyprus and enjoy your holiday. Thanks for your comment. It’s hot in Cyprus here so try to go very early. Good fun though and as you say feel less guilty when having a beer!